Raymor stands for simple, classical design that provides excellent function, fine engineering & great value of money. Classic designs, practical brilliance, and unrivalled quality combine to provide the ideal finish for your bathroom. Raymor bathroom accessories are created to last for years in both build and style. Showers The Raymor Brighton shower range brings functionality to any Kiwi bathroom catering for all areas of the market with its elegance and style. White powder coated or metallic anodised frames provide a minimalist look with durable functionality. Basins Raymor countertop basins are ideal for those who seek a modern look. A single tap hole allows the addition of a mixer tap, or no tap hole for combination with hob or wall mounted tapware. Raymor undercounter basins are designed to sit well in any counter, with smooth lines and elegant rounded contours. Combine a Raymor basin with a quality tap for a look of distinction. 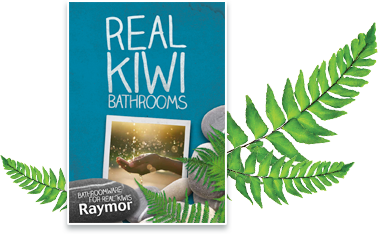 Vanities Raymor vanities have been specifically crafted to complement any New Zealand bathroom. Raymor vanities come in three finish options, white gloss polyurethane finish or two options of charred oak and driftwood melamine. Raymor vanities have either fully integrated vitreous china tops and overflow wastes, or striking poly marble finishes. Towel Warmers The Raymor range of towel warmers has been designed to complement any bathroom. Traditional, modern or contemporary, our style fits your style, with a size to suit any wall area. These frame towel warmers are made from high polish stainless steel and a durable construction. Tapware The Raymor tapware range is assembled and tested in New Zealand and takes a modern slant on classic design creating a wide appeal for all home decors. It's available in basin, bath, sink and shower tapware. We offer an affordable alternative for mains and all pressure situations that does not compromise on quality. Accessories With Raymor's impressive range of bathroom accessories you may find yourself making a few additions to your bathroom. Our range is custom designed to complement your Raymor bathroomware perfectly. Toilets The Raymor Dawson Back to Wall suite has been carefully crafted to deliver affordability and flexibility with style. Sleek modern styling and smooth clean lines are yours with Raymor. Complimenting a wide range of bathrooms, the Dawson’s stunning design not only makes it appealing to look at but also very easy to clean. Baths The Boston bath offers a traditional yet affordable solution to any kiwi bathroom. Solid construction and enforcement allows confidence when choosing this Raymor product in your next project. Laundry Tubs The Raymor range of laundry tubs brings functionality to Kiwi Laundries, with a two drawer model with handy storage buckets, a single door model with built in storage basket or a slimline model for laundries with limited space. All laundry tubs come with a Raymor all pressure mixer and cabinets made from thick, long-life powder-coated galvanised steel. Keeping it Kiwi, all laundry tubs are assembled and tested in New Zealand.